OVERCOMING OBSTACLES - TRUE STORY!! !What do you do when you’re born with two digits on each hand and your legs are amputated at the knees when you’re three? Hee Ah Lee was born with sever physical deformities. She only had two fingers on each hand. And her legs ended at her knees. Her doctors didn’t expect her to live. But she did live. Lee’s mother became unexpectedly pregnant while married to a disabled man. Doctors told her that because of a medication she had been taking her child would not be normal. She elected to continue with the pregnancy and in 1985 in Seoul, South Korea, little Hee Ah Lee was born with only two fingers on each hand, disfigurement of her legs, and slight brain injury. The hospital told Sun that she could not care for the child at home and relatives wanted her to place the child for adoption in a foreign country. Sun thought her baby was beautiful, however, and was determined that she would live a successful life. When Lee was a pre-schooler her mother decided that she wanted her daughter to take piano lessons and for two reasons. One was that she felt it would help her strengthen her hands so she could hold a pencil. The other was that she felt that if she could master the piano, she could master anything. For six months piano schools turned them down then the one teacher who did accept the task got discouraged and wanted to quit. It became a three-month contest of wills between mother and daughter that led to a confrontation in which Sun actually threw her daughter on the floor in frustration. Lee got back up on the piano bench and for the first time played the children’s song she had been trying to learn. That was the turning point and one year later Lee won the grand prize in a piano concert for Kindergartners. It was at age 7 that Lee won Korea’s 19th National Handicap Conquest Contest and was presented with her award by the President of Korea. Today Lee is 22, has won numerous awards, and is a widely traveled concert pianist with more than 200 appearances. 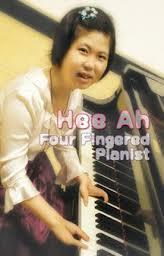 Her first album titled “Hee-ah, a Pianist with Four Fingers” was released in June, 2008. Lee gives tribute to her mother for challenging her to master the piano and said that although her training was difficult, “as time went by, the piano became my source of inspiration and my best friend.Nothing is impossible in life. Its only our thought and belief that matters.